Surely, rigorous research supports these headlines’ claims, right? Scientists must have found significantly higher rates of illness in a group that trained at a CrossFit affiliate two days in a row, as compared to a group that took a rest day in between. And obviously, the study’s researchers must have explicitly recommended that CrossFit athletes take a day off after a single workout day to avoid this illness. Otherwise, the press would avoid baselessly defaming CrossFit affiliates. Strangely, the Gizmodo article itself quoted this exact statement from Tibana toward the bottom of the article. How did Gizmodo’s headline writer take a recommendation to rest after two days of training, and turn it into headline recommendation to rest after a single day of training? So the paper’s data supports claims about a correlate of sickness, not sickness itself. Again, the media has favored sensationalist headlines about CrossFit. This is both annoying and a dereliction of duty since it represents time they could have spent addressing real problems, such as the lifestyle-related chronic diseases that kill 1.8 million Americans yearly. A search for New York Post coverage on “obesity” produces an article exclusively dedicated to “healthy s’mores” – complete with vegan marshmallows, which somehow manage to contain even more sugar than regular marshmallows. This may not surprise you, though. Does anyone still consider American journalism to be near its heyday? 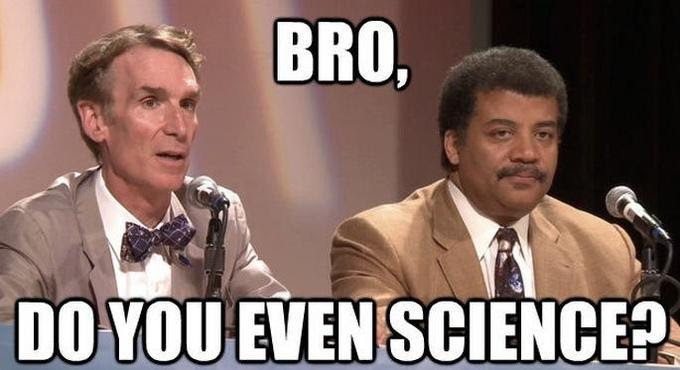 Scientists still enjoy considerable prestige, especially among non-scientists, as witnessed by rampant Bill Nye and Neil Degrasse Tyson memes. Unfortunately, science’s practice does not always live up to its ideals. American exercise science, especially. Let us now turn to the study itself. Normally, we may trust researchers’ basic integrity. Their conclusions and assumptions may be off base, but if the researchers write that the subjects followed the Paleo diet strictly for two months, we do not conclude that they instead ate ice cream on a regular basis. We cannot assume integrity in this study, however. Author James Navalta has a history of recklessly tolerating fraudulent research, at least when it harms CrossFit affiliates. Navalta is the editor of the International Journal of Exercise Science, the journal that published Steven Devor’s and Michael Smith’s second fraudulent study on CrossFit 614. Known to Russell’s Blog readers as the “Paleo Fraud,” this study claimed that subjects ate strict Paleo, when some in fact violated the Paleo diet at every meal. Not only did the subjects not follow strict Paleo, the lifestyle challenge they participated in did not require them to. I reported these findings to the IJES, which described my email as “compelling” and “serious.” IJES then emailed Devor and Smith, who insisted that their study was accurate. This was enough for Navalta and his Co-Editor-in-Chief T. Scott Lyons. Navalta took Devor and Smith at their words, and kept the study published. And this despite the fact that Devor and Smith had already failed to substantiate their fraudulent data in a related study, which was already the subject of multiple lawsuits. Should we trust Navalta’s integrity this time? If The Researchers Didn’t Lie, What Does The Study Mean? Even assuming for sake of argument that the researchers did not fabricate their data—does the recovery study still make any sense? First, the researchers failed to record the performances the athletes achieved. This oversight is especially problematic for the two AMRAP workouts, where both the volume and intensity depend entirely on an athlete’s effort. Any CrossFit athlete knows the difference between lazily getting through an AMRAP, and pushing the pace for the duration of the workout. And 45 reps of double-unders and snatches will affect biological markers differently than 400+ reps will. We cannot know which end of the spectrum the athletes fell on in this study, which further muddies the waters. Unhelpfully, the researchers allege that “the goal of the endurance conditioning sessions” was to “complete each training session in the quickest time possible, without compromising exercise technique.” Again they were AMRAP workouts: in this type of workout the time domain is fixed for all participants. I for one, would like to know how the subjects attempted to complete a 10-minute AMRAP “in the quickest time possible.” Chuck Norris must have been a subject—he once completed a 10-minute AMRAP in 4 minutes. If the researchers intended to assess the “influence of different CFBT sessions on immune response in our cohort of adult men,” these highly similar training sessions fall short. The subjects were “recruited through advertisements,” the workouts were performed in a laboratory, not in a CrossFit affiliate, and the researchers refer to the programming as their “experimental design.” These facts imply that the researchers designed this programming themselves, specifically for the purpose of this experiment. Programming faults therefore are the researchers’ complete responsibility. Is performing nearly identical programming, with four separate training components, two days in a row truly representative of most training at CrossFit affiliates? Say the athletes instead performed Cindy on the first day, and 7 sets of 2-rep deadlifts the next day. Could we reasonably expect a similar physiological response to more varied CrossFit workouts? If the answer is no, then we cannot generalize from the results to what happens in “CrossFit” generally. The study’s results would only apply to gyms that regularly perform nearly identical, higher-volume programming on consecutive days (more likely to happen in a bootcamp or spin class than in CrossFit classes). What if the Data Still Applies Beyond This Particular Case? Let us grant, for the sake of argument, that the data is not fraudulent AND that the programming effectively relates to what happens every day at CrossFit affiliates. What implications might the data have for a trainer or athlete? The researchers in this study present IL-6 as “pro-inflammatory,” yet other research suggests that IL-6 also exhibits “anti-inflammatory properties.” They present IL-10 as “anti-inflammatory,” yet in certain situations, IL-10 may have pro-inflammatory effects. Did the anti-inflammatory cytokines significantly increase or decrease following two consecutive days of CrossFit training? It’s not clear. Why does their abstract’s conclusion directly contradict their paper’s conclusion? So did IL-10 levels significantly decrease 24 hours after the first workout, and 24 and 48 hours after the second workout, or not? It depends what line you read. (Though, in fact, both claims could be false). Perhaps the conflicting claims about significance stem from the researchers first calculating the changes in absolute values, and then calculating them in terms of percentages. They do not elucidate, nor negotiate, this apparent contradiction. We are left to guess. And this is not some tangential issue—the alleged decline in anti-inflammatory cytokines was the primary finding of the study, judging by the researchers’ press release and conclusion. If the authors are not sure whether this decrease was statistically significant, one wonders why they chose to highlight it. Then again, their abstract claimed the anti-inflammatory cytokines increased, not decreased, after the two training sessions, so who knows? And while they were at it, the researchers could have corrected the media that misrepresented and misinterpreted their work. On the other hand, spreading misinformation about CrossFit affiliates has become a minor industry. And would we expect James Navalta, who already tolerated fraud about CrossFit, to suddenly discover integrity?